Anyone who cooks regularly will tell you that it's not hard to lose track of the time when you are preparing a meal. You step away from the kitchen for what seems like five minutes and your batch or cookies are burning in the oven, or your pot of spaghetti is bubbling all over your stovetop. When you set your desired time, the timer will sound a shrill three-second alarm to let you know that your time is up, which means you can remove your delicious meal from the oven or stove before it is overcooked. 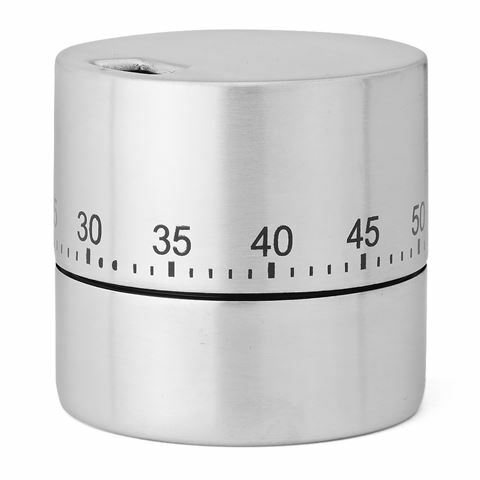 It's also made from stainless steel with an exterior printed with numbers between zero to 60, this little timer might be just the thing to save you from burning the Christmas turkey...again. Exterior is printed with numbers from 0 to 60. Mechanical timer counts backward from 60 in minutes. Sounds a 3-second alarm when your time is up. Manually adjust the minutes by turning the dial clockwise and backward to select your desired time. Dimensions: 6cm (w) x 5.5cm (h).